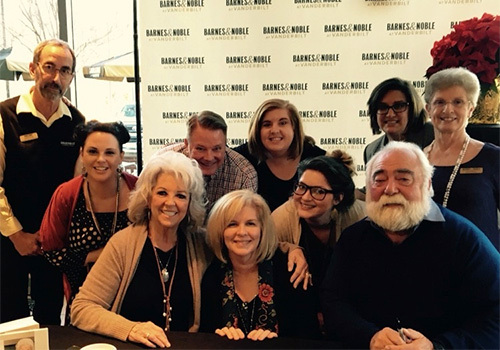 Celebrity chef Paula Deen poses with her husband Michael Groover (front far right) and the staff of the Barnes & Noble at Vanderbilt University Bookstore in Nashville, Tennessee. 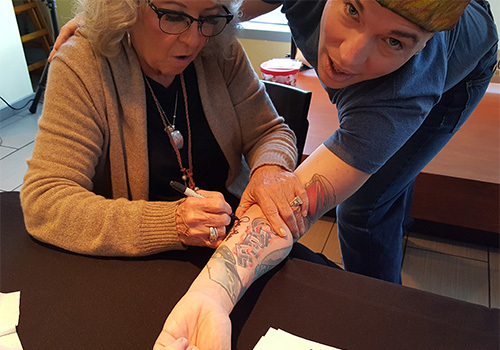 The self-described queen of southern cooking, Paula Deen, delighted fans in Nashville, Tennessee during a recent book signing of her latest cookbook, Paula Deen Cuts the Fat. In attendance for the event was C.J. Miller, who had Deen autograph his arm with the intention of going directly to a tattoo parlor to commemorate meeting of his favorite chef. “I’ve been a fan of hers for as long as I can remember,” says Miller, who credits Deen with inspiring him to become a chef. Fan C.J. Miller has is arm autographed by Deen with the intention of going to a tattoo parlor to ink her signature. The culinary icon is a self-made success story who learned the secrets of southern cooking from her grandmother. Her successful career began with her first catering business, The Bag Lady, which led to the opening of her first restaurant, The Lady and Sons, in collaboration with her sons Bobby and Jamie five years later. In addition to her success on television and popular restaurants, Deen is a two-time Emmy award winner and the author of 14 cookbooks that have sold more than 11,000,000 copies. Paula’s magazine Cooking with Paula Deen celebrates its 10th year and has over 3 million readers.